Freshwater Lakes Faststamps from Midpex Hytech machines. As previously announced Royal Mail took Post and Go along the Fosse Way to Midpex - but there were two machines, not just one. Machines A3 and A4 which were taken to Melbourne for the Australia 2013 show were available with, for the first time from the Hytech machines, the Freshwater Lakes designs issued in Post Offices on 25 June 2013. Freshwater Lakes collectors set, receipt, and Union Flag collectors set. The Flag set from Hytech machines were first issued 26 September 2012. 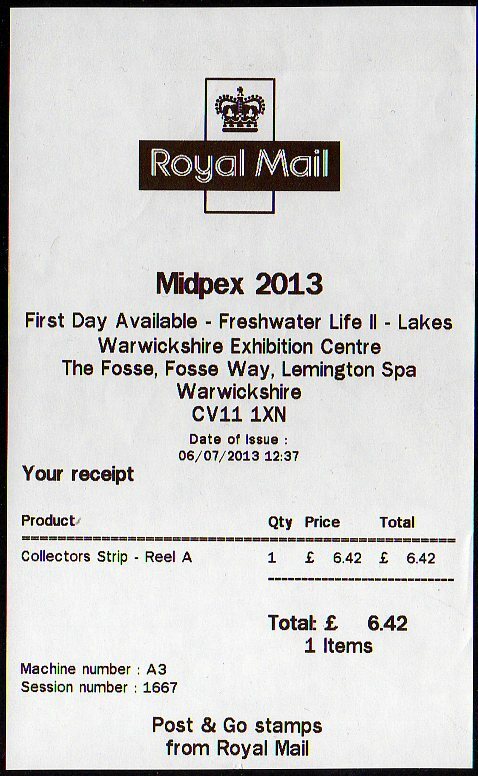 As can be seen the receipt records the First Day of Availability of the Freshwater Life II stamps at Midpex, on 06/07/2013. There is an error on the receipt as the postcode of the venue is CV31 1XN not CV11 and, as pointed out in the comments, Leamington is spelled incorrectly! "On Friday afternoon (5th July) the two machines were set up. Due to location of the venue (i.e. country side) there was a week WiFi signal. It was taking longer than usual to process each transaction. Fortunately there was a telephone connection in the office next to the machine, the Engineer managed to use the cable and get the connectivity. 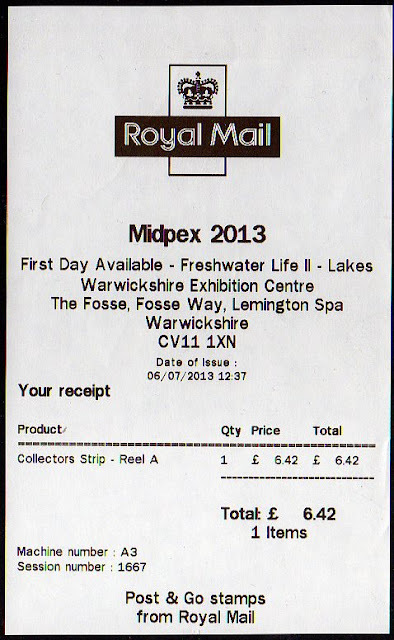 Receipts for the stamps purchased that afternoon were dated 6th July. I don’t think that there were any receipts dated 5th July. "As the machines were left on during the night of Friday 5th July, early users (mainly dealers) of the machine on Saturday 6th July found that the receipts were dated 7th July (i.e receipts were dated 6th on 5th so it would change to 7th on 6th). This was noticed and date corrected before the show opened at 10 am. " When I go to events like this, I will often buy some of what is available, especially for long-time customers who have asked beforehand. Inevitably after I have posted images here, more people contact us to ask if we have any for sale. Usually the answer is no, or not in the form required. In future I will make more effort to solicit your orders within the blog, before I go. But if I don't and you would like me to try to get what you want, then please ask before the event, or by email/phone early on the day (see website for phone and email details). There is nothing easier, and cheaper, than selling something to somebody who has asked for it. There is much more effort in buying for stock, judging what to buy, adding it to the shop, and waiting for people to pay for it. So take advantage of the opportunity, and ask before the event. I won't be attending the York Fair. Ian - I understand some dealers used the machines before the show opened on Saturday and have receipts dated 07/07/2013 as well ! Thanks Frank; maybe the date was changed on Friday during the session so that some Friday strips had Saturday's date (6th). If dealers bought on Saturday before that was corrected, then of course the machines would produce strips with Sunday's date. A bit of a mess really. Not only is the postcode wrong, they also spelt "Leamington" wrong!